Many parents and teachers have reported that power struggles are greatly reduced when they focus on solutions. Focusing on solutions creates a very different family and classroom. Your thinking and behavior will change, and so will the thinking and behavior of your children. 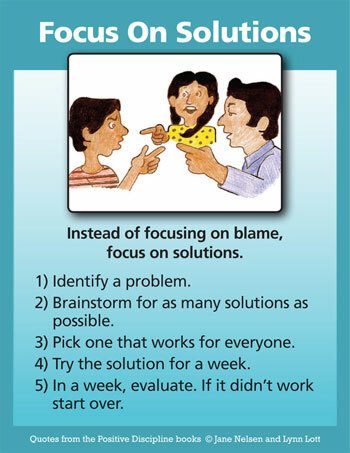 The theme for focusing on solutions is: What is the problem and what is the solution? Children are excellent problem solvers and have many creative ideas for helpful solutions when adults provide opportunities for them to use their problem-solving skills. The Three Rs and an H for Focusing on Solutions are the same as the Three Rs and an H of Logical Consequences. In fact, the first 3 are identical. They are presented again here to help change the tendency toward the use of Logical Consequences in favor of Focusing on solutions. During a class meeting, students in a fifth-grade class were asked to brainstorm logical consequences for two students who didn’t hear the recess bell and were late for class. 1. Make them write their names on the board. 2. Make them stay after school the same number of minutes they were late. 3. Take away from tomorrow’s recess the same number of minutes they were late today. 4. Take away all of tomorrow’s recess. The students were then asked to forget about consequences and brainstorm for solutions that would help the late students get to class on time. 1. Everyone could yell together, "Bell!" 2. The students could play closer to the bell. 3. The students could watch others to see when they are going in. 4. Adjust the bell so it is louder. 5. The students could choose a buddy to remind them that it is time to come in. 6. Someone could tap the students on the shoulder when the bell rings. The difference between these two lists is profound. The first looks and sounds like punishment. It focuses on the past and on making children pay for their mistakes. The second list looks and sounds like solutions that focus on helping the students do better in the future. 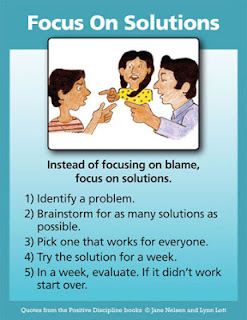 The focus is on seeing problems as opportunities for learning. In other words, the first list is designed to hurt; the second is designed to help. Focusing on consequences feels punitive and negative, as if experiencing the wrongness will motivate to change behavior for the better, when all it does is discourage. Where's the hope? Focusing on solutions is moving on without wasting time or emotion on "wrongness". It feels loving and proactive, and it evolves the situation for the better. It helps instead of hurting.